The mother of a OL (office lady) sends her an old dresser. The thing is much too big for her small apartment and she doesn't know what to do with it. The OL's life with six spirit children begins. Warm and nice story about family and frenship. About feelings. Good things come then you realy need them even if you do not expect it. Anime about little miracles in our everyday life. I realy like this kind of stories and would like to recomend it everyone. Art is simple enouth but for this kind of story is the best solution. It reminds me oldschool anime were main thing is story, not art. Characters are interesting and in 23min we can see all disposition. Due to the lack of free time which is supposed to be allotted for my daily serving of anime, I resorted to watching short anime films and such. Of course, I was hoping to find something as magnificent yet light as Tsumiki no Ie. Then I stumbled upon the 4 short anime shows that comprised the 2010 Young Animators' Training Project. As the name of the said endeavor implies, its an on-the-job-training project funded by the Japanese Animation Creators Association to train fresh aspiring animators. Although I found it not as touching, unique and outstanding as Tsumiki no Ie, this anime collection was still worth the watch as each story brought me back to those shows and stories I used to love when I was still a child. Having been produced by Production I.G., the same people who served us loads of great anime through the years, amazing classics like Neon Genesis Evangelion and Ghost in the Shell, the wild and random FLCL and touching anime series like Kimi ni Todoke and Higashi no Eden, Somehow, that set the bar quite high for me for this show, Tansu Warashi (The Wardrobe Dwellers). Although it was quite a letdown after seeing this show's art compared to the first 3 of the 2010YATP shows (I watched this one last) rather simple (although this observation is just superficial to its overall quality), and the story not as deep and touching, as exciting or not even gripping as I was expecting it to be (granted it's from Production I.G. ), the show still proved to be very enjoyable in itself being a short lighthearted and laid-back slice-of-life tale. 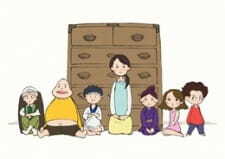 Tansu Warashi is the story of a regular OL (office lady), Hiiragi Noel and her brief yet unforgettable experience with six spirit children who live in a dresser that is passed down for generations of the women of the Hiiragi family. They also claim themselves to be the servants of the current Hiiragi family's mistress, or more likely, the mistress of her own apartment, Noel, and are bound to correct her too carefree ways of living, teach her to become a responsible adult, and help her bloom into a beautiful yet modest woman. The best part about this show, I could say, is its story. Like how its opening goes, Its quite relaxing and fairly easy to digest. Like I've mentioned earlier, having a warm yet light atmosphere, its like being served with a bowl of warm and tasty rice porridge. The consistency is perfect, the suitable amount of elements of comedy and emotions mixed in complement the flavor very well, providing the viewers with a healthy, hearty slice of life. Also, I loved the mix of characters that comprised the six wardrobe dwellers. Jirokichi, the safety specialist who looks like a mountaineer/archaeologist, Masa, the cook who dresses like a sushi chef, Yuki, the beautician with her curls and pouty lips and Tae, the motherly figure who teaches Noel the perfect manners looks like a traditional Japanese woman wearing a kimono. Daigoro the fat glutton and Hanpei the brat may seem like useless characters but I believe their presence might be for the purpose of training Noel on how to handle such troublesome folks. Although, from one's observation, the show's backgrounds look really very simple, like something that popped out from a children's picture book - lightly colored with minimal detail, I think it fits the shows lighthearted theme nicely. Also, the characters are drawn with just enough to little detail and with flat colors, reminiscent of classic anime like Doraemon. Another thing I couldn't help but notice is the dynamic images (e.g. characters) that move around a very light background throughout the show seems a little offish especially when the background turns dark, but maybe its just a matter of preference. The background music is very nice and pleasant, as expected from a relaxing theme of a show. Good lighthearted themes all throughout the scenes with a few memorable ones like the whistling laid-back theme where Noel returns home from work red-faced and a little tipsy and the light quirky theme during Hanpei's first appearance. The ED theme also provides good relaxing music fitting the short animation on a squiggly animated box that plays with it. Overall, it provided me with a perfect relaxing end after watching the 2010YATP shows in one sitting. Usually, lighthearted and easygoing shows like this tend to stick to my head for quite sometime . It provides a good escape from the busy and tiring monotony of everyday life by sharing the same fun, mellow and pampered feeling similar to Noel's experience with her wardrobe dwelling friends. Wardrobe Dwellers is basically Snow White if Snow White was a Japanese salarywoman. Also if Snow White didn’t have any singing or dancing or evil witch or basically anything interesting at all. A salarywoman moves into an old flat where magical fairies live in her wardrobe who tell her to kill hookers and something about her grandmother also owning this wardrobe. It’s supposed to be about the passing of generations and tries to lean on the nostalgia button, but never really pulls it off. Characters don’t show enough emotion or personality to feel anything from their reactions to events. The wardrobe dwellers themselves are pretty boring people. Once they show up, they don’t really do anything else interesting. I was expecting them to do some funny stuff, maybe crack a few jokes or some slapstick humour, but the overall mood is too busy lounging around that it can’t work up the enthusiasm to have anything energetic happen.